SMCES strives to provide a holistic Catholic education to nurture life-long learners who are members of a dynamic faith-filled community whose purpose is to continue Christ’s work in the world. 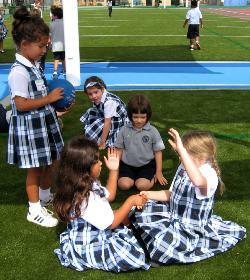 SMCES is a vibrant parish school that educates diverse learners from TK – 8th grade. Founded in 1930 by the Sisters of the Holy Name of Jesus and Mary we believe in continuing the service and love of Jesus Christ, guided by the Holy Spirit and Gospel values. Together with our families, we are a welcoming community that provides a safe and loving learning environment. SMCES strives to inspire academic commitment and excellence by providing students with teachers whose expertise serves their individual needs. Through building relationships, we nurture compassionate, responsible, well-rounded citizens who are prepared to meet their full potential. St. Monica Catholic Elementary School Students FLY ! Faithful – We pray to God and follow the example of our friend Jesus. Learners – We are curious, active, growing scholars. Young Citizens of the World – We are kind citizens who make good choices and care for others. Faithful – We live Gospel values and demonstrate fortitude. We actively participate in the Catholic faith. We engage in Christian service. We respect the beliefs and traditions of others. Learners - We practice academic honesty and responsibility. We listen, write, and speak effectively. We apply and develop knowledge and learning strategies across the curriculum. We use technology and media appropriately, effectively, and responsibly. Young Citizens of the World - We respect God and self. We respect others and their unique talents and abilities. We demonstrate good stewardship of God’s creation. We display cooperation, good sportsmanship, teamwork, and leadership.